The Clock section shown is not included in the Macfarlane catalogue of patterns. You can see where the clock mechanism has been taken out and sent away to be repaired. I have recently been in touch with Ramsey Town Council about the current repairs taking place on the clock mechanism and they have kindly given me the following information. 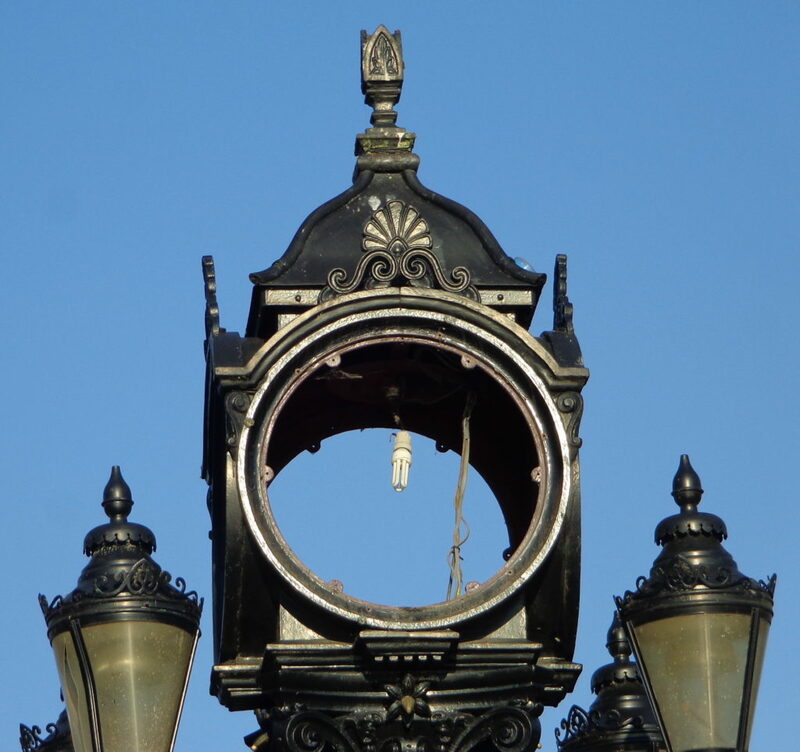 Over the years the clock has had several repairs, some of which “left a lot to be desired” as there were cut down broom handles replacing metal rods within the gearings and the electrics looked like “spaghetti junction. About 18 months ago it was repainted by a local man, John Taylor, who is the husband of a previous Mayor. The clock face and gearings are currently with Smith of Derby, well known clock engineers, for an overhaul. Their proposal is to manufacture new clock dials in the same style replacing the movement with two of the latest mains synchronous units, being accurate at +/- 1 second per month.
. Operates in temperatures of plus 53 degrees and below minus 20 degrees. The existing drive gears are being left in place but bypassed by installing the new movement directly on the back of the new dials with new patterned hands. The clock movements would operate via an Automatic Re-Start Unit (ARU) located in the base of the clock. This would re-start the clock after power failures at the correct time upon resumption of the power. In addition it will automatically adjust between British Summer and Greenwich Mean Times each year without manual intervention. Just for further information they are due to reinstall the clock faces and mechanism on Thursday 23rd March. Follow this link to see Photos. I hope to provide more information soon.